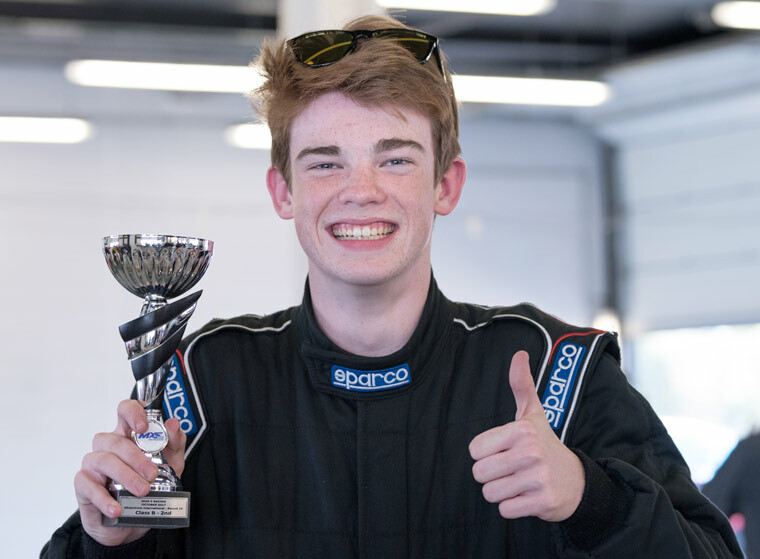 Teenager Josh Malin, a Y13 student at Ferndown Upper School, has just won the Class B MaX5 Racing Championship at Silverstone, despite being told from a very young age that due to his illness, he would never be able to become a racing driver. Whilst still in nappies watching his uncle and grandfather compete in Hill Climbing and Sprint Racing competitions, Josh Malin had ambitions of becoming a racing driver, but his dreams were almost destroyed when he was diagnosed with Type 1 diabetes when he was just four years old. He was told that a career in racing driving would not be possible. Thirteen years to the day, Josh strutted off the tarmac at Crofts Circuit as the winner of his first race. When asked which his favourite race was, Josh said, “In May 2017 I raced at Castle Combe in the pouring rain. Our cars were actually aquaplaning. The thrill of the race definitely made it that little more fun, especially as I won that race, too. Had I have been in Class A, I would have finished second, but because I drive an older car in Class B (which is technically slower) I won my class by quite a way. Josh will be attending an awards ceremony in November at the Leicester Marriott Hotel to collect his trophy for winning the MaX5 Championship.